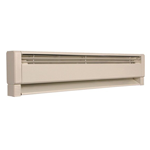 Baseboard heaters are a great solution for heating rooms. They require very little space and are often inconspicuous. They are safe, quiet, energy efficient and are easy to install. Most electric baseboard heaters range from 500 watts to 2000 watts in power, which translates to about 50 - 200 of square feet of heated space. They are ideal for room-by-room heating troughout the house or as a supplemental heat source in a single room. We carry a range of electric baseboard heaters and can recommend the right solution for your home. Call us today for a quote.